honey is relatively inexpensive. No in-depth technical knowledge is needed to keep bees. One needs only patience and a love for God’s creatures. a living from the forest by respecting it. Pollinators like bees make a big difference in local farmland by pollinating the various cash crops grown there. Yields up to 30 percent more are available to those farmers who have hives located in proximity to their fields and orchards. Farming and beekeeping go hand in hand. In most African countries farming is still the biggest profession. Since beekeeping is an occupation available to all farmers, it can seriously augment their income. Diversity of crops grown and products produced is what makes it so a farmer can survive and be economically stable. 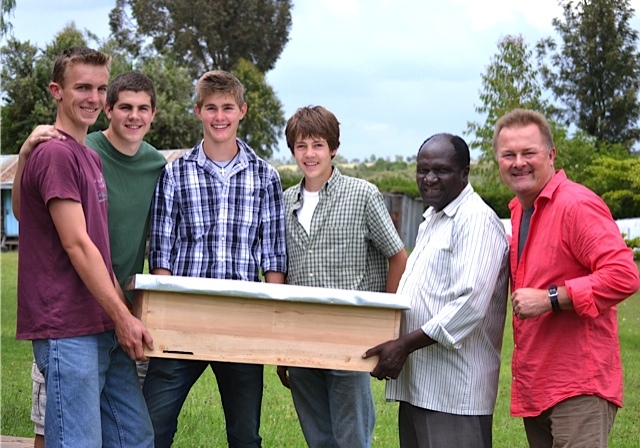 Join with us in encouraging and aiding African people in beekeeping. Since 1/3 of all the food in the world comes from pollinators, especially honey bees, the life you change may just be your own.